Four players from the same club comprised one winning team. 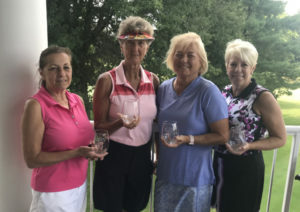 The other title-winning group was composed of four players from four different clubs.What they shared were close calls in the 2018 Kent Memorial Low Handicap tournament on July 18 at O’Bannon Creek Golf Club in Loveland. The Hamilton Elks team of Linda Coffey, Vicki Felver, Hilda Hodges and Lori Roberts shot a combined 152 to edge by one stroke the teams of Diane Bizzare, Greater Cincinnati Women’s Golf Association President Tracey Capuano, Ali Green and Nancy Vincent and Brandi Duckwall, Stacy Hinkle, Sandy Roark and Julie Sizemore for the Low Gross championship. Low Gross Winners of the Low Kent, left to right: Linda Coffey, Hlda Hodges, Vicke Felver, Lori Roberts. In the Low Net competition, the team of Sue Brainer (Kenwood), Patti Horne (Wyoming), Carol Sarver (Losantiville) and Bev Weeks (TPC River’s Bend) needed a scorecard playoff to squeeze past the Wetherington team of Liz Devine, Tony Mathevy, Terri Proud and Francie Russell after both teams finished at 129. The title is the third for the multi-club team since the players got together in 2011. Ties are broken by assessing each team’s performance on the course’s most difficult hole – the 465-yard, par 5 No. 4 at O’Bannon Creek, Brainer said. The Low Gross title is the second straight for the Elks crew, Coffey said. No more than five strokes separated the first- and fourth-place teams in the Low Gross scoring, while just two strokes separated first from fourth in the Low Net. Brainer believes the Low Kent format was one reason for the close scores. Competitors have handicaps of 18.0 or lower while players in the annual Kent Memorial High Handicap tournament – scheduled for July 26 at Hyde Park Country Club – range from 18.1 to 34.3. The Kent Memorials were created in the mid-1950s in honor of Mrs. Sydney B. Kent, a long-time Cincinnati Country Club and Women’s Western Golf Association board member who maintained in her life a keen interest in teaching ethics, courtesies and rules of the game to upcoming junior golfers. 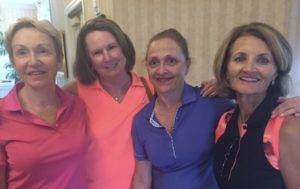 The tournament originally was a net best ball foursome event before evolving into a flighted event at two different courses with gross and net prizes. Brainer and Coffey agreed that O’Bannon course was challenging. “There’s some hidden water and creeks – which I was in,” Coffey said ruefully.